Monday morning my legs were still feeling a bit stiff from the long run on Sunday so I took it easy with a short 25 minute walk with the dog. It was dark and crisp outside and really helped me wake up. I had my notorious oatmeal with banana and almond butter for breakfast before heading out to work. 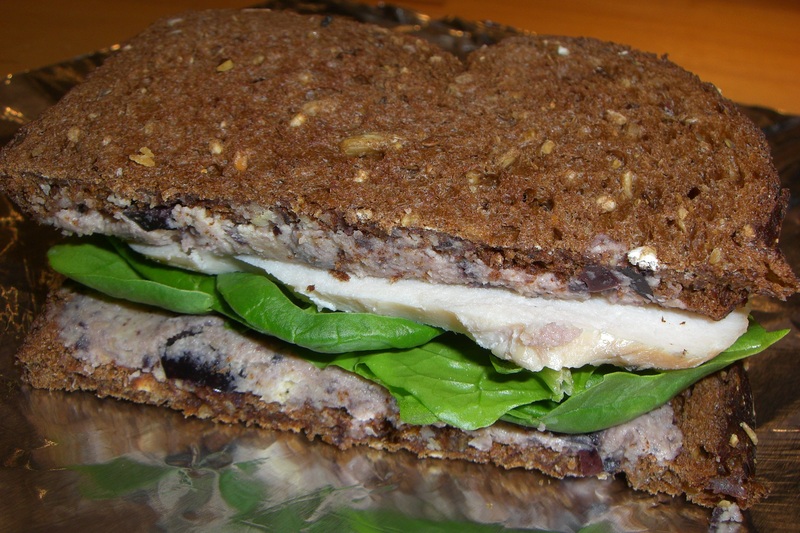 Since we have a ton of left over herb turkey, I made a yummy half sandwich of sweet dark bread, olive hummus, spinach and turkey for my morning snack. Along with a couple of clementines, my snack kept me going till lunch. I’ve decided that all the turkey has to be eaten before the big Turkey day. For dinner I made a whole wheat pizza. While I let the dough rise a bit I knocked out Week 2 Day 1 of my push ups. It was the most difficult push up day so far. I didn’t feel like I had any strength. I’m hoping that Wednesdays push ups go a little better. 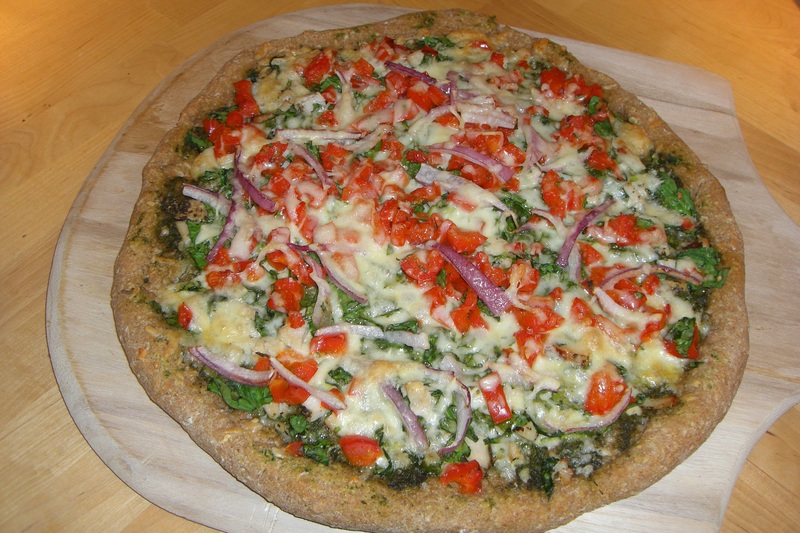 Once I was able to use my arms again comfortably I topped the pizza with pesto, herb turkey, spinach, roasted red bell peppers, red onion, mozzarella and Parmesan cheese. It’s so much fun to experiment with different flavor combinations on pizza. We had some salad along with it to round it out. After dinner I enjoyed a piece of pumpkin pie. It tasted even better than the day before! This morning I got up and ran 3.1 miles (32 minutes). Running first thing felt great. I haven’t done it for a couple of weeks since I’ve been going on lunch break runs but the morning run was perfect. No rain, just nice and crisp outside. I treated myself to a jar of oatmeal/oat bran with hemp protein powder, 1/2 banana, chocolate and peanut butter. 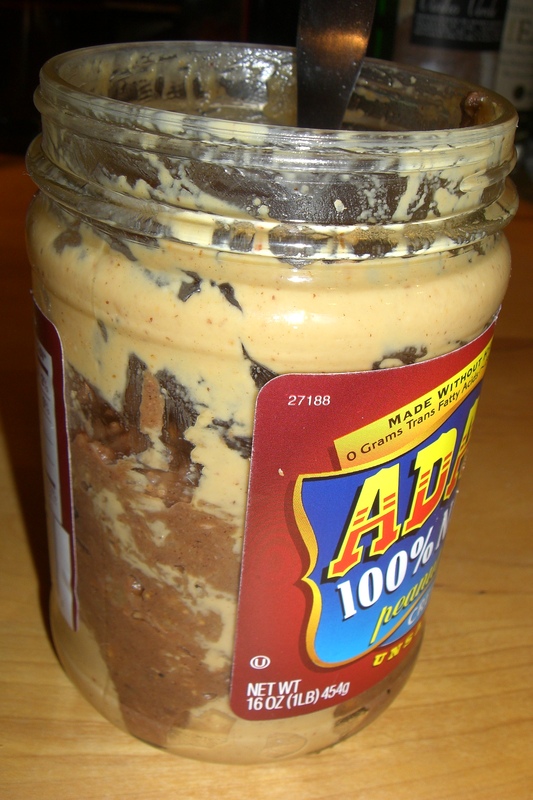 The peanut butter was just about empty so I made sure not to miss out on any of the goodness. What’s better than chocolate and peanut butter?? ?